Computer-controlled, high-speed, single-thread chainstitch, button-neck-wrapping machine. APPLICABLE: For flat buttons, shank buttons, marble buttons and stay buttons ( counter buttons ), for mens suits and ladies outer-wears. ♦ Max, button size - 38 mm. Lockstitch, automatic welting machine (for slanted pockets with flaps). Corner-knife cutting adjustment through the operation panel. APPLICABLE: For sewing pockets (with flaps) on suits, jackets and pants. ♦ Max. welt length - 220 mm. 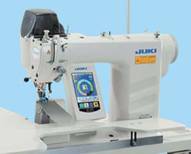 Computer-controlled, dry-head, lockstitch sleeve setting machine with multi-programming device. Automatic, 2-needle, belt-loop attaching machine. ♦ Finished length of belt-loop 48 - 78 mm. ♦ Belt-loop width 9 - 20 mm.